The classic round cake gets beautifully embellished in fresh new ways. Real flowers and buttercream flowers adorn this wedding cake. With gumpaste blooms. By Liz Shim of Eat Cake Be Merry. With hand-cut overlay. By Duff Goldman of Charm City Cakes. With sugar lace "hem." By Cupcakes Couture of Manhattan Beach. With hand-pulled sugar ribbons and profiteroles. By François Payard. With sugarpaste hummingbird. 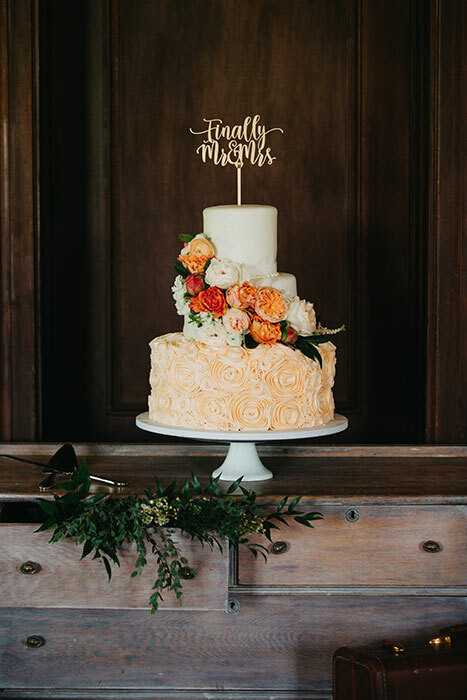 By Heather Barranco of Dreamcakes. Trimmed with crystals and edible glitter. By Penny Stankiewicz of Sugar Couture. With tangerine-scented fondant. By Jay Muse of Lulu Custom Cake Boutique. With sugar rose petals. By Cupcakes Couture of Manhattan Beach. Adorned wtih sugar flowers. By Sugar Couture. With burlap trim. By Jim Smeal. With fondant trim and sugar flowers. By Sugar Couture. With multi-dimensional blooms. By Jim Smeal. With off-center tiers and sugar flowers. By Cupcakes Couture of Manhattan Beach. With cascading pink rosettes. By Sugar Couture.